A boy called George had a brilliant idea To be like the heroes of old. He would go off and search for a dragon. To prove he was fearless and bold. Join George, a young and courageous explorer with all the pluck of a little Indiana Jones, as he zooms back in time to track down a dragon! George climbs in his time machine with only a scooter, some cakes and tasty doughnuts to aid him in his quest. When he arrives in long, long ago he spies a dragon straight away! Or does he . . . ? 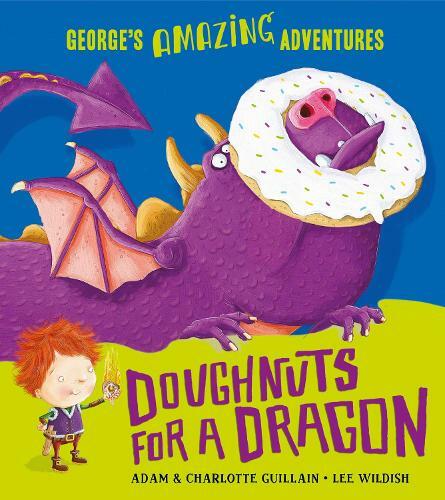 Doughnuts for a Dragon is a fast-paced, funny, rhyming romp about princesses, witches, dragons and George - an intrepid kid determined to time travel and see a dragon. George's first adventure Spaghetti with the Yeti was shortlisted for the Roald Dahl Funny Prize and the Sheffield Children's Book Award. Ideal for fans of Aliens Love Underpants and Supertato. Perfect for kids aged 3 and up. Find more treats and daring feats, collect all of George's Amazing Adventures: Spaghetti with the Yeti, Marshmallows for Martians, Doughnuts for a Dragon, Pizza for Pirates, Socks for Santa, Treats for T. rex Adam Guillain is a performance storyteller and was the Roald Dahl Museum and Story Centre Writer in Residence. Charlotte Guillain is a prolific author of children's fiction, non-fiction and picture books, and together they have created the hugely successful George's Amazing Adventures series. Lee Wildish lives in Lancashire and has been illustrating from a very young age. He loves illustrating children's books and thinks there's nothing better than seeing people laughing at a book he's illustrated. His titles include The Spooky Spooky House which was the winner of the Red House Children's Book Award 2013, and the New York Times Bestselling How to Babysit a Grandpa. Yes it's back to the Dragon age for George, he meets a Princess who follows him. He meets a witch and an ogre, they both want to eat him but he has bought snacks and they take those instead.